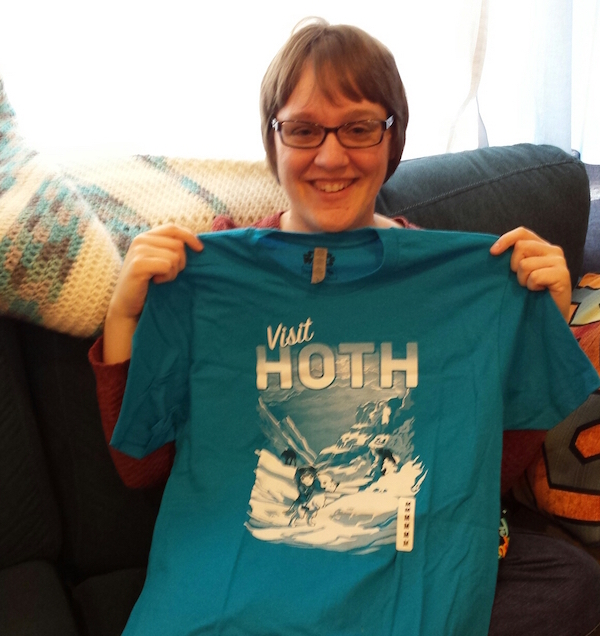 Matt and Shelby got me a "Visit Hoth" shirt - my favorite Star Wars planet :) When I was in middle school, I loved the taun-tauns so much that I invented a campaign - "Save the Taun-Tauns!" Of course, it didn't do anything, but I thought it was catchy. Matt and Shelby also got me a CD by Imogen Heap, one of my favorite artists, and the Audubon guide to Rocks and Minerals. So cool! 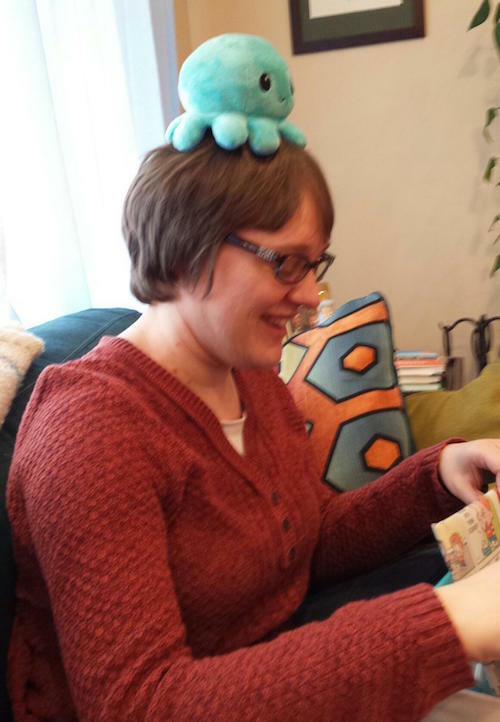 Voli is a little blue octopus that I got my brother for Christmas. He has a smilie face on one side and if you turn him inside out he has a cute frowny face :P He sat on my head! Mom and Dad also got me presents :D I got a glow-in-the-dark moon calendar, an advanced aromatherapy book, and a Christian coloring book. I'm looking forward to learning more about the compounds in essential oils and precautions for how to use them safely. I'll also be able to follow the moon phases and learn more about the rocks that make up our planet :3 I'll have to study all of these things while wearing my new nerdy Hoth shirt, hehe! 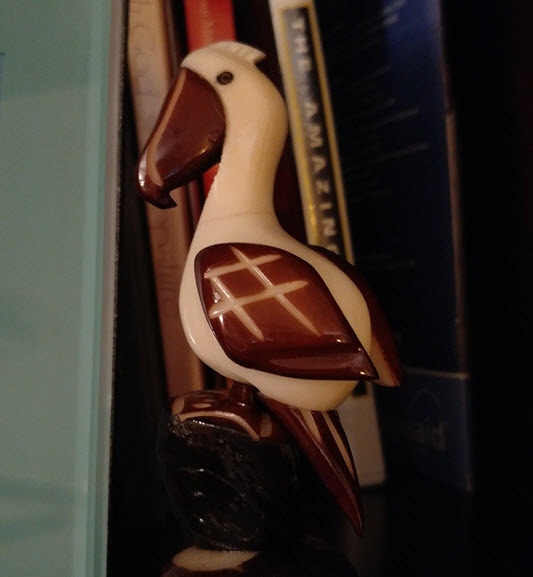 They also got me a really neat pelican carved from a South American nut. 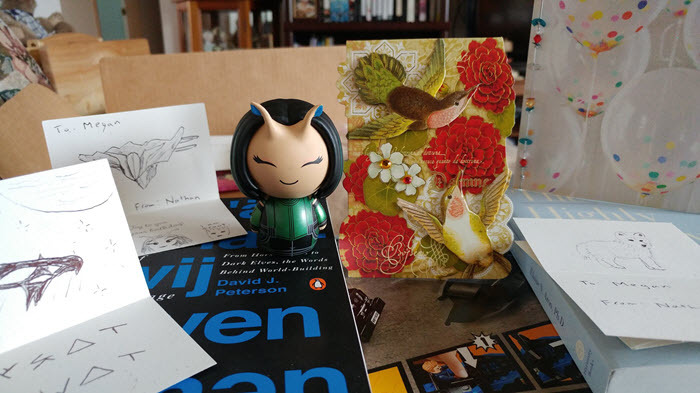 It's so adorable :D Thanks for all the lovely gifts, Dad and Mom! 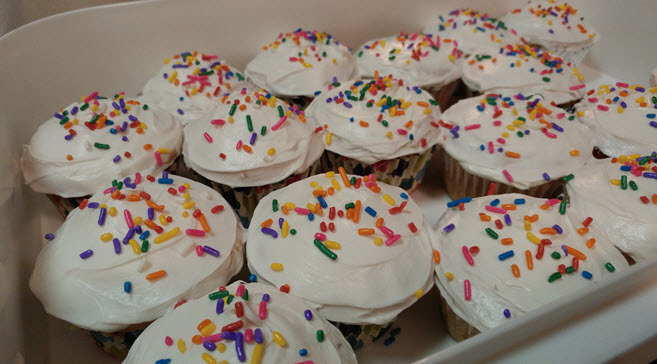 Mom made Funfetti cupcakes for the church snack on Sunday, my actual birthday. They got colorful balloons, too! I like how colorful my birthday was this year :) At church, Dad preached a sermon from the first chapter of 1 Corinthians. We learned about God's amazing love and Christ's humility and power. After church, we went out to lunch at the Watson Inn. I had a delicious seafood dinner, yumm. 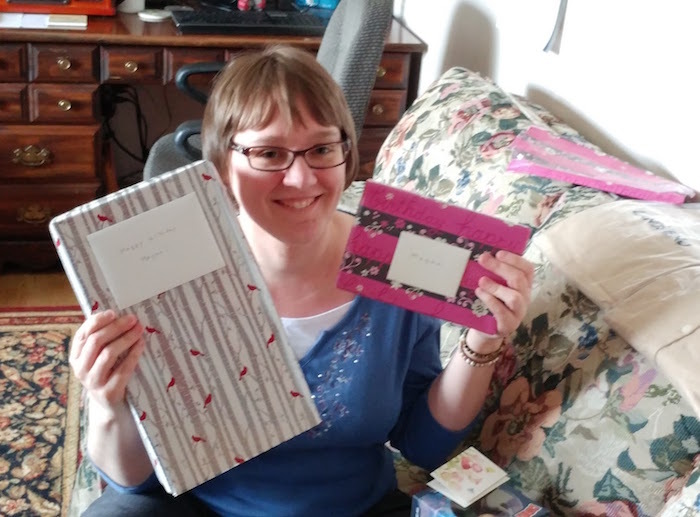 Each present was wrapped in pretty paper with a separate note. 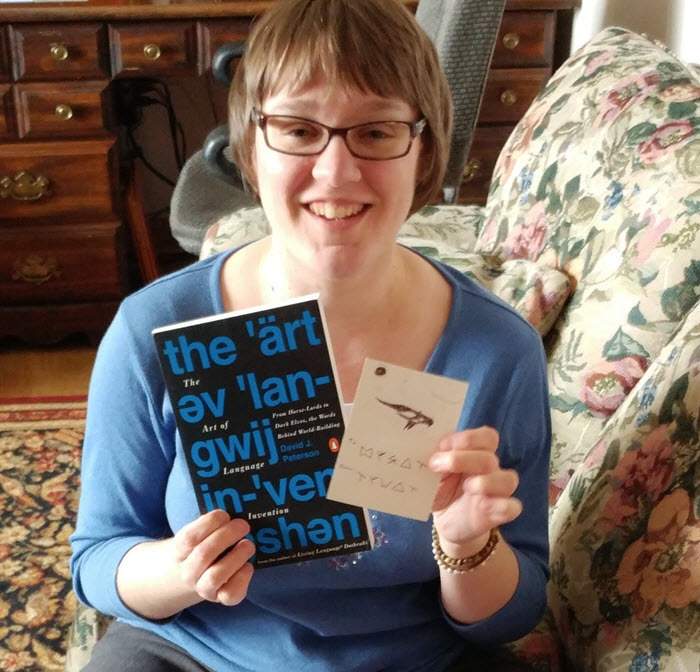 Nathan had designed a card with art and writing to match each gift. They are so beautiful and creative! 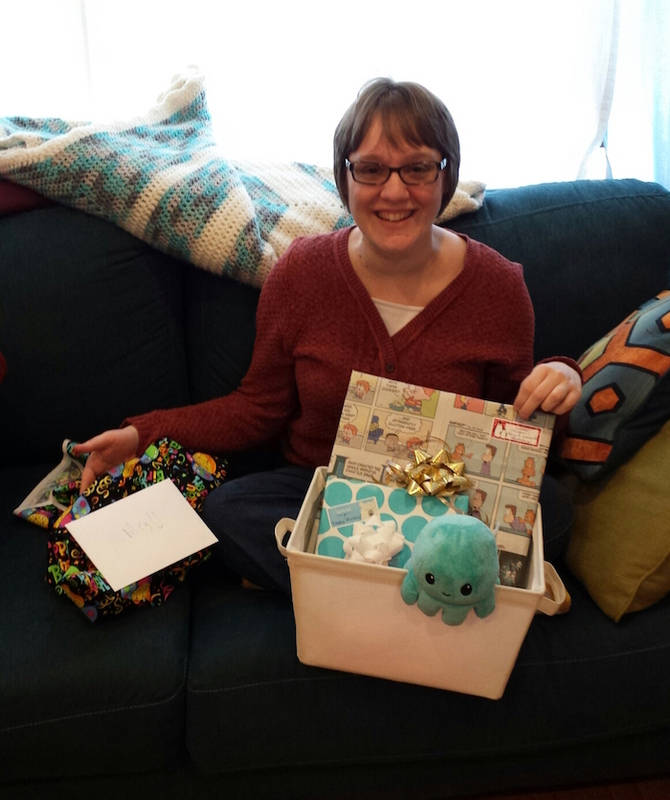 His family also included a gift of a cardigan and cute balloon card. It was so kind of them! 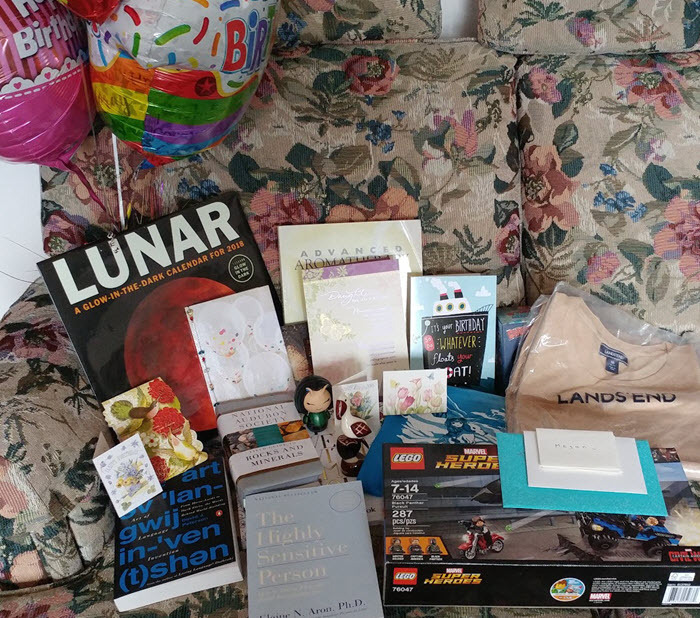 All the presents together :D I also got a lot of cards and a lady from church baked my favorite cake - Shoofly cake! 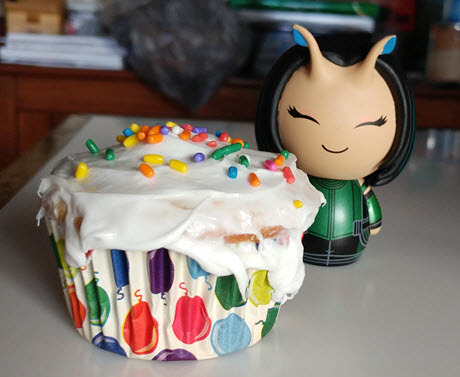 It's so good, yumm. 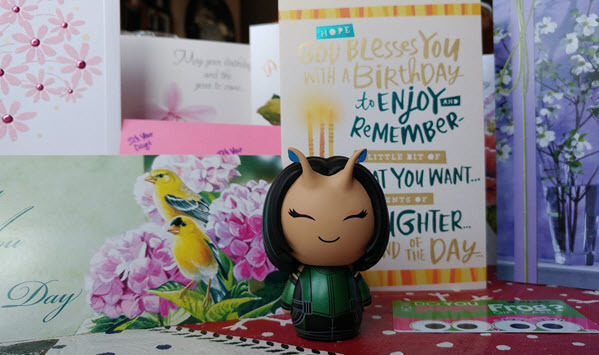 I also got a few other sweet gifts and kind greetings. Everyone has been so kind. At work on Monday, my boss baked me a chocolate cake and some coworkers wished me a happy birthday. It was really nice :) Today, it's snowing out, so I hope I won't get too white on my way to lunch, hehe.